I am still working on this still life that was begun in January. Some paintings come to fruition with greater ease than others. With this painting I have been experimenting some, and with some experiments they land you in a pickle! Sigh. The last time I worked on this painting I made a real mess of it because I was trying out different colors for the background, playing with layers of paint and seeing how they combine. It is only paint but sometimes it takes awhile to figure out how to dig out. When this happens to me, I end up hanging the problem child on our living room wall so I can observe it under different lighting conditions and moods. 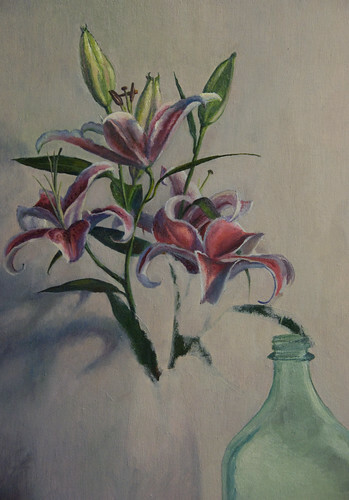 This gives me time to pause and contemplate what I want to achieve.
. simplify the composition some.
. work on the main grouping of lilies and the larger glass bottles that appear in the background. Once these are pretty much laid in and resolved, I will then add a few more flowers to the front of the composition and then unify the composition.
. switch between sable and bristle brushes more often to vary the paint texture. Initally I was painting only with sable brushes like my NGA copy. I am now feeling hopeful about this painting. It has been my main focus this week and will probably be the main focus of the weekend, and I anticipate that it will still be several weeks before it is completed. However now that I have overcome the initial hump, I am becoming attached to this painting more and more because it has requiring so much contemplation and problem solving. Two aspects I love about the creative process of painting. Until the next time, have a wonderful weekend! And thank you for stopping by and reading. PS. have you seen this video of Daniel Sprick? I watched it earlier this week and @10:23 where he shares how every piece of the painting must work out and how there are timese when something in the painting that should take one day to complete will take him a whole week to work out has been replaying in my mind since then. Hearing this reinforces the idea that even accomplished artists like Daniel Sprick also go through similar experiences when creating art as I experience.